I made this for happy_potterer, as a birthday gift. I didn't have a pattern; I just started crocheting, and I thought it turned out pretty cute. I love the colors; I used a self-striping soy wool (Paton SMS, I think it's called). I'd use that yarn again, for sure. 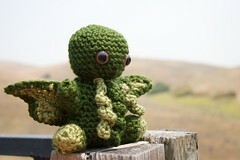 Hee - Okay, I'll give you a quickie Cthulhu-101. Cthulhu is definitely evil. Like WAAAAY evil, but he's just so cool that he has a big cult following of people (like myself and many others here) who just adore him. :D He was created by horror writer H.P. Lovecraft, and he's one of the "Great Old Ones" - a terrifying, evil god whose hobbies include driving people insane and/or eating them. Fortunately, he's said to be asleep at the bottom of the ocean (so not wreaking devastation upon at at the moment). For some reason, like I said he's become a sort of cult figure. During the 2004 election, I saw people wearing "Why Vote for the Lesser of the Evils" t-shirts with pictures of Cthulhu (and I think some people even wrote his name in on their ballot). EEEEEEE OMG THERE HE IS!!! I mean, he's also right here, but still.